Most people probably have an idea of what Analytics is: data, analysis, metrics, and business intelligence are just the start… it is an abstract concept that is difficult to summarize in a sentence or two. A first of its kind training in the Philippines, Mr. Daniel Meyer introduces what analytics is all about as he will be giving Filipinos a chance to learn more about his expertise on analytics and its purpose to the fullest by partnering with PMCM Events Management. Filipinos will surely benefit and learn from Mr. Meyer's seminar. Most business leaders know that they need more analytics based decision making in their operations, however few have figured out how to obtain it as analytics software or engaging high priced consultants doesn't suffice. “This is where I come in. Having spent 15 years as an analyst with Wells Fargo Bank U.S.A., I have combined that practical experience with my educational background; I have a Master’s Degree in Education, and developed an innovative training approach to analytics,” said Mr. Daniel Meyer, CEO of DMAI.Mr. 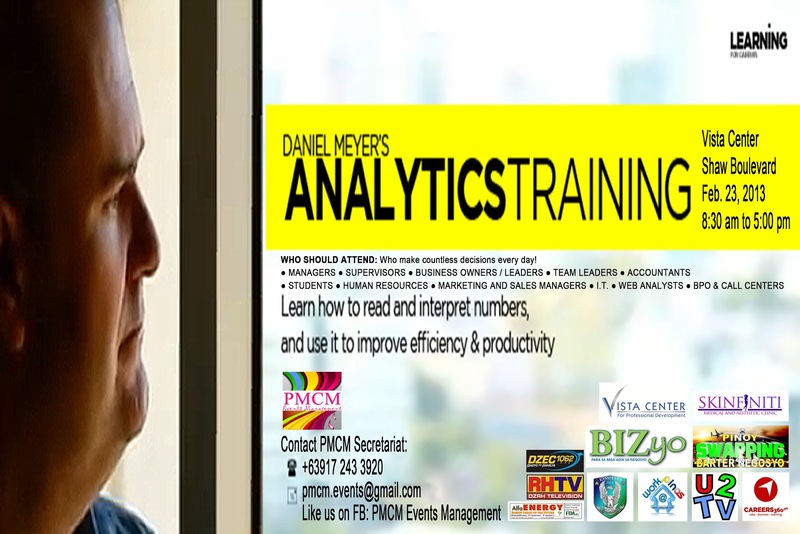 Meyer specializes in a variety of analytics training solutions including ones designed for call center managers, recruiters, HR professionals, fresh grads, and analysts. WHO SHOULD ATTEND: Who make countless decisions every day! TICKET IS ONLY P 2,500.00 WITH AM AND PM SNACKS, CERTIFICATE OF PARTICIPATION, MODULE, GIVEAWAYS FROM SPONSORS.